barley recipe collection. Indian barley recipes. Barley is more commonly known as jau in India. It is a cereal grain, just like wheat and oats, but is considered much healthier. There are many varieties of barley available in the market and they are also sold either hulled or un-hulled. Barley can and should be used as a replacement of rice due to its health benefits. Barley is slightly chewy in texture and nutty in taste. The time to cook barley varies according to whether the grain has the outer shell removed or no. Barley may require soaking before cooking to fasten the cooking process. 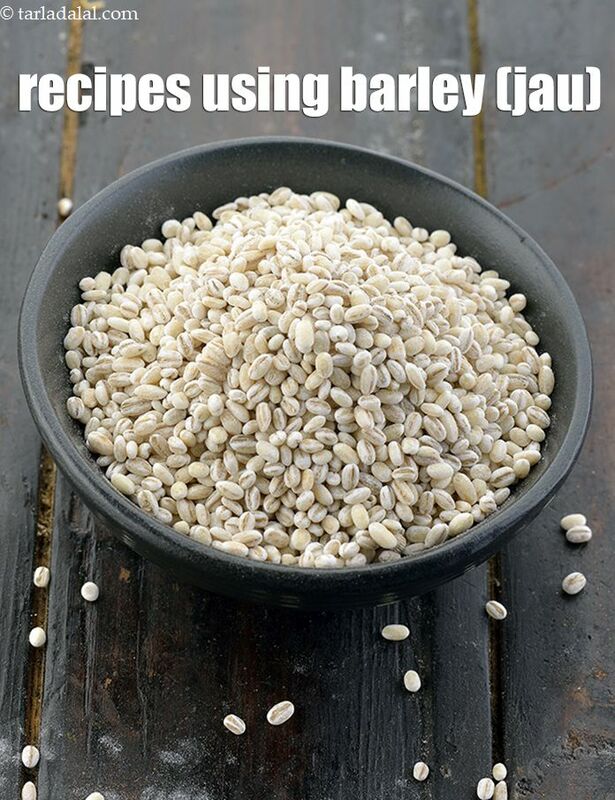 Barley, or Jau, is a grain that should be incorporated in everyone's diet. Not only does it really help in losing weight due to its high fiber content, it also helps combat diseases like cancer and diabetes. See here for detailed benefits of barley. As I already mentioned, you can replace rice with barley. Barley Vegetable Khichdi is the perfect recipe to experiment like this. With different vegetables and tadka but the same cooking method, no one would realize that they are not eating rice! If you don’t want to go the extra mile, you can simply make Barley and Moong Dal Khichdi. Just plain Barley Water can also do wonders for you. It not only aids digestion but is also great for those with a sensitivity to food. Soups too are a great way to pack in some health. Mushroom Barley Soup, a flavorful, clear soup with hints of onions and garlic, will make you forget all mushroom soups! You'd be surprised when you find out the amount of stuff you can make with barley that isn’t boring! For example – Barley Idli. A twist to the south Indian classic, this dish is made with a rice, urad dal and barley batter AND stuffed with different vegetables, making it one of the most innovative snacks. Another great way snack is a Barley, Feta and Spinach Salad! The nuttiness of barley combined with the saltiness of feta cheese and crunchy vegetables makes for a perfect evening snack. Hope you liked this collection of Vegetarian Barley Recipes. Scroll below for the best barley recipes! An appetising combination of fresh veggies and protein-rich beans cooked in olive oil, which contains a blood cholesterol-lowering substance called 'squalene'. Antioxidants like 'quercetin' and 'selenium' found in onions protect the heart from free radical damage. Barley mix is a delectable and healthy mix of barley seeds or jau mixed with bananas,dates, raisins, cashewnuts and topped with honey. An energy packed vegetable soup recipe, Barley & ros. vev. Soup has barley cooked till tender along with herb like bay leaf. A thick brothy soup, barley and ros soup is imply amazing and can be enjoyed as a complete meal. It is a very healthy soup which can be eaten to even reduce weight or cholesterol.It is a very simple soup which can be made very easily with house old materials. Tarla Dalal Hi John, Thank you so much for your kind words. Happy to know that.